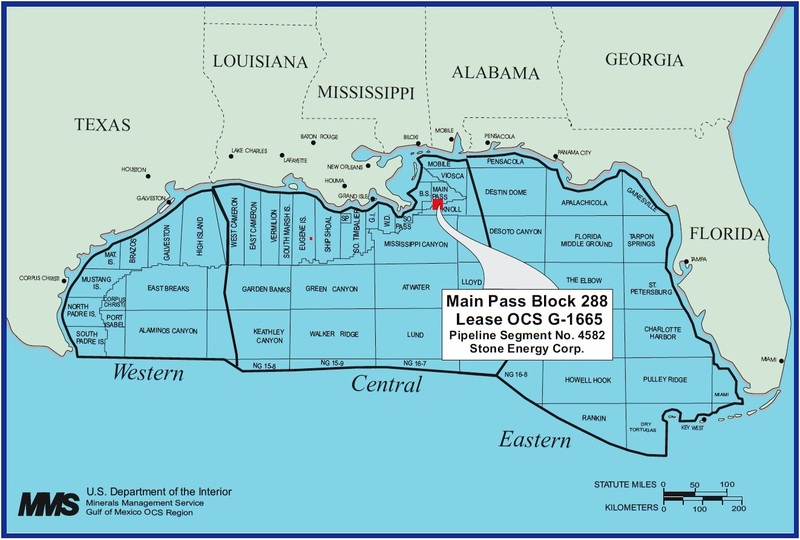 This investigation report by the US Minerals Management Service (MMS) was conducted in conjunction with the U.S. Coast Guard (USCG) and is referring to several pollution events were reported in the Main Pass Block 288 area GoM, over a three-week time period beginning 31 May 2007. On 31 May 2007, the National Response Center (NRC) received a report that indicated a 350-foot by 100-foot oil slick had been sighted in the Main Pass Block 288 area. In the following three weeks, four additional oil slicks of various sizes, color, and consistency were reported in the same area. On 23 June 2007, a major spill (the Spill) was reported to NRC in a subsequent report. The Spill covered an area 30 miles in length by 6 miles wide and was later estimated to be comprised of 187 barrels (bbls) of oil. In the year prior to the Spill, throughput in the 4.5-inch oil pipeline averaged about 2,000 barrels of oil per day (BOPD). No unusual operational problems were reported by the Operator, and no indications were received of any abnormal operating problems or deficiencies in the pipeline segment. It operated without a major reported incident. May 31, NRC report No. 837010, MP-288, 350 feet x 100 feet, unknown color. June 7, NRC report No. 837842, MP-287, 1.5 miles x 200 yards, dark brown. June 7, NRC report No. 837874, MP-288, 800 yards x 200 yards, brown, reported as 20 barrels (bbls). June 17, NRC report No. 838922, MP 288, 2 miles x 2 meters, silvery sheen. June 19, NRC report No. 839058, MP-288, 1 mile x 1 mile, rainbow sheen. MMS inspectors were unable to identify positively the source of these slicks. However, MMS inspectors reported that personnel for other operators in the area indicated that they suspected the possibility of a connection between the mystery slicks and the 4.5-inch oil pipeline, PSN 4582. On 23 June 2007, the Spill occurred. An oil slick, 30 miles in length by 6 miles wide, of unknown origin was reported near the Platform. An overflight by MMS personnel confirmed the presence of the slick, but its origin could not be determined from aerial reconnaissance. The volume of the spill was estimated to be 187 bbls based on slick size and sheen appearance. Estimates that up to 214 bbls were lost in the two weeks preceding the Spill were later amended by the Operator. Stone personnel stated that they did not believe the previous reports of sheens in the area originated from the Pipeline. It was reported that there was no metering at the departure point for the 4.5-inch outer diameter (OD) oil pipeline (PSN 4582) from the MP-288 “A” Platform. At the time of the Spill, the pipeline was averaging a throughput of approximately 2,600 BOPD and either was operating between 500 and 800 psig with the pipeline pumps on or between 50 and 100 psig when the pumps were not running. The pressure of the ocean on the Pipeline was approximately 175 psi. Therefore, at average operating pressure with the pumps running, the positive pipeline pressure would have been between 325 and 625 psi. Based on this pressure and the size of the holes found in the pipeline, other methods of estimating the Spill volume would be theoretically available. However, no observable loss of throughput was seen at the receiving platform, MP-289 “B.” No noticeable pressure drop was observed in PSN 4582 and the pressure safety low (PSL) sensor did not activate. Therefore, the slick size was used to estimate the Spill volume. According to the Operator, some evaporation was taken into account. MMS personnel landed on the Platform and discussed the spill event with Operator personnel. The Operator initially questioned the possibility that the PSN 4582 was the source of the Spill. The MMS requested “fingerprint” samples of the oil throughput in PSN 4582 and requested PSN 4582 be shut in and pressure tests performed. On 23 June 2007, two gas pressure tests performed on the 4.5-inch oil pipeline (PSN 4582) created an additional slick and bubbles, indicating that the pipeline was leaking. The leakage during these tests was of a character and size that recovery was not feasible. PSN 4582 was immediately taken out of service. On 24 June 2007, the Operator activated their Spill Management Team in their Lafayette office. Divers were mobilized to the Platform location on board the Motor Vessel (M/V) Agnes Candies, a 220-foot dive support vessel, to determine the damage and make repairs. Additional support mobilized included a 145-foot crew boat, a 110-foot utility boat, the M/V Mark C, two helicopters, and additional manpower and equipment as needed. 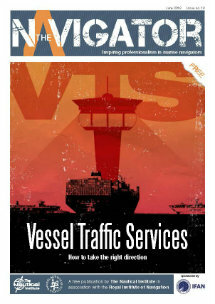 The spill management vessels and equipment arrived on location on 25 June 2007. The Operator initiated overflights to monitor for additional oil slicks and submitted a second NRC report, identifying the source of the previous Spill as being the Pipeline. equipment was placed on standby in case further releases required containment or recovery. On 26 June 2007, divers were jumped to examine PSN 4582. It was pressured to 250 psi. Shortly after gas injection was begun, a 200-yard x 10-foot light silvery sheen was detected on the surface. This sheen rapidly dissipated. The divers then patrolled the route of PSN 4582, discovering four holes in a 100-foot segment in the area between 860 feet and 960 feet from the Platform. The divers inspected the pipeline 150 feet beyond the last hole, but found no additional holes. PSN 4582 was then de-pressured, and the inspection halted. The remaining approximately 15,000 feet length of PSN 4582 was not examined. 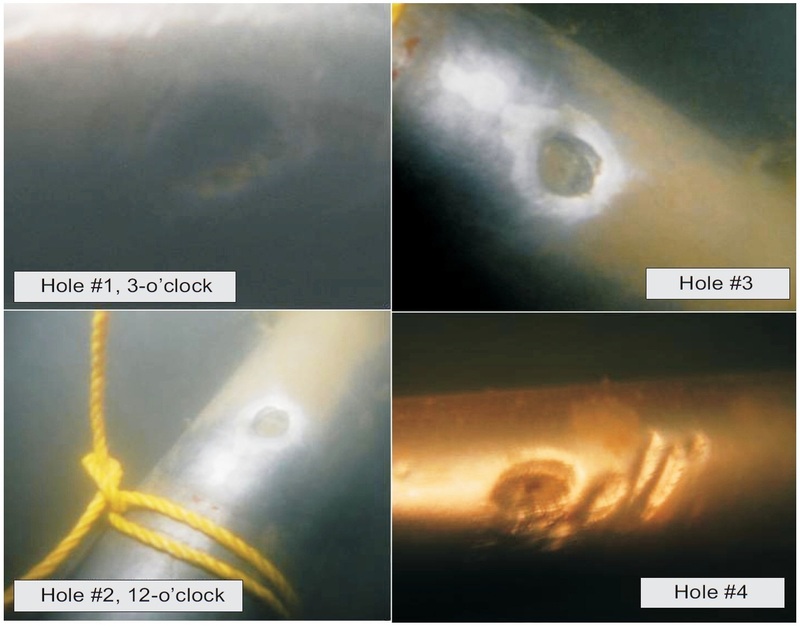 Divers then cleaned around all four holes and covered them with duct tape after inspecting the pipe for external damage and finding none of critical significance. Hole No. 4 was found to be ⅛-inches x ⅞-inches; Holes Nos. 3 and 2 were both approximately ¼-inch diameter. The divers found some damage to coatings and pipe in several places. They also reported that almost all the anodes they checked on both PSN’s 4582 and 4581 were fully depleted. skimming unit, a 100-barrel tank, and four personnel. Overflights were conducted five times daily within a 5-mile radius of the Platform to monitor for any additional sheens. These overflights detected two sheens 2.5 miles southeast of the Platform, one covering an area 5 miles x 50 feet, and the other 300 feet x 300 feet. Problems were encountered with the dive support boat’s thrusters, thereby requiring it to return to port, delaying the source abatement. Over the next five days while repairs were being performed on the dive boat, four additional small sheens were reported in the area. The boat repairs were completed and the dive boat returned to the site and initiated source abatement operations on 1 July 2007. These operations, including sealing the holes with clamps and pigging and pressure testing the pipeline, were completed by 3 July 2007. The MMS notified Stone that the pipeline could not be reactivated until repair procedures were submitted and accepted by the MMS Pipeline Section. On 3 July 2007, Stone submitted repair procedures for PSN 4582 to MMS for acceptance. However, on 5 July 2007, MMS determined that the pipeline was no longer fit for purpose. Therefore, MMS directed Stone to flush and fill immediately PSN 4582 and to submit an application to decommission the subject pipeline. Subsequently, on 14 January 2008, the Operator submitted to the MMS Pipeline Section a decommissioning application for PSN 4582. It was approved by the MMS Pipeline Section on 10 March 2008. The 4.5-inch oil pipeline PSN 4582 was found to have four holes within a 100-foot long section, which allowed the release of the crude oil. The holes were caused by corrosion. The cathodic protection (CP) prior to the Spill had deteriorated below the minimum level required to protect the pipeline and had remained in that state for at least six months. The failure of the CP was responsible for the corrosion of the pipeline. In April 2007, the level of CP was found to be below minimum acceptable levels for PSN 4582. The Operator failed to take timely action to remedy the deficiency. This allowed the ongoing corrosion to form the holes in PSN 4582.